After a nine year hiatus, the Atlanta Biennial returns to showcase Southeastern art. 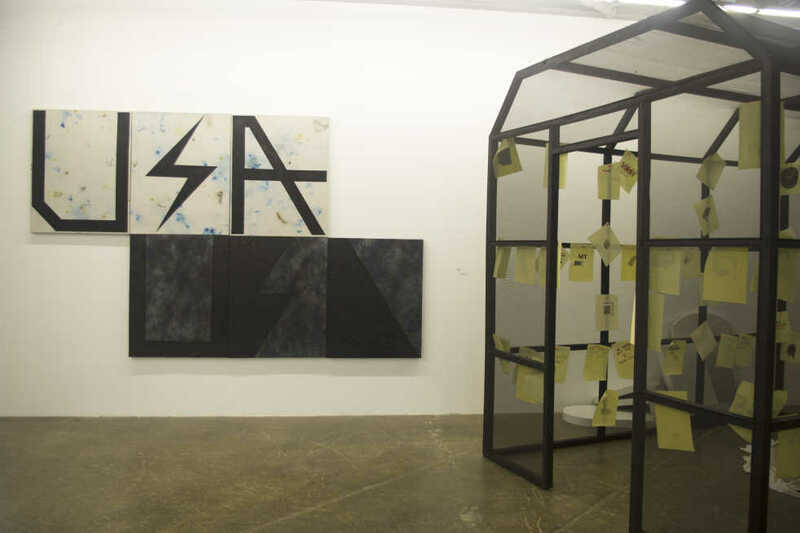 At Atlanta Contemporary through Dec. 18, the exhibition features 32 emerging artists. The Italian term “biennale” or biennial typically refers to large scale contemporary art exhibitions that are held every other year. Some biennials, like the Venice Biennial which has been happening since 1895, display art from all over the world, while others focus in on a region or single city. The original Atlanta Biennial began as a response to a snub of Southern artists by the Whitney Biennial, one of the taste-making exhibits in the U.S. In the 1984 iteration, no work from Southern artists was included, so curator Alan Sondheim established the Atlanta Biennial. While the geographic range changed over the years, the exhibition drew attention to Atlantan, Georgian and Southeastern artists until 2007.
director of Art Papers, and Daniel Fuller, the curator of Atlanta Contemporary. Aaron Levi Garvey, the co-founder of the Long Roads Projects and an independent curator based in Jacksonville, Fla., and Gia Hamilton, the director of the Joan Mitchell Center in New Orleans, ensure an experienced, regional perspective. The curators share the common goal of highlighting new Southeastern voices, featuring individuals and collectives who had never been in the Atlanta Biennial. Artists representing 10 states reopen the dialogue about the South’s place in the art world by exemplifying the variety and quality of contemporary art emerging from the region. different works that prove the region pushes the forefront of contemporary art. One piece to look out for is the Dust-to-Digital’s “Covered Up,” which hides behind the wall near the entrance to the exhibit. In the narrow, long alcove, Atlanta newspapers from 1916 to 1919 are papered up on the wall. Atop a wooden crate and Fulton Cotton Mills bag, a RCA Victor radio plays a sound collage of recordings made between 1915 and 1929. The exhibition includes works that address contemporary issues, such as police violence, race relations and gender stereotypes. Katrina Andry’s “The Cultural Lineage of the Hypersexual Male” also tackles societal problems. In this woodcut on top of a digitally created quilt, a white man drinks a beverage and reaches towards a bouquet of flowers, legs, breasts, and bananas, while a black kid takes notes behind him. The Biennial kicked off with Art Party on Sep. 27. The annual fundraiser supports free admission every day. Besides the opening of the biennial, the event included open studios, special presentations and the announcement of the 2016 Nexus Award recipient, Larry Walker. While at Atlanta Contemporary, visit other exhibits, such as “Before We Blast off: The Journey of Divine Forces” through Nov. 6 and Mild Climate’s “breakfast lunch & dinner” through Oct. 30. To become part of the Contemporary+ program, visit six or more times during six months to receive a free Atlanta Contemporary t-shirt, or visit at least 12 times in a year and receive Friend level benefits, which include exhibition previews with curators, a 10 percent shop discount and discounted tickets to special events.